Sealaska Heritage Institute (SHI) is recruiting artists for its new spruce-root weaving mentor-apprenticeship program, which seeks to revitalize the ancient but endangered art form. Successful candidates will learn to gather and process spruce roots, then learn to weave through Haida artist Delores Churchill, an internationally recognized master weaver and the namesake of SHI’s artist-in-residence studio. A spruce-root weaving program was ranked as a top priority at SHI’s first Native Artists Gathering, which brought together nearly 30 artists in 2015 who identified the most imperiled Northwest Coast Native art traditions, said SHI President Rosita Worl. Apprentices will first learn to gather and process spruce roots with Mary Lou King and Janice Criswell from May 12-14, 2017. The workshops with Churchill are scheduled July 31-Aug. 12 and Oct. 30-Nov. 4 in Juneau, but SHI encourages weavers from other Southeast Alaska communities to participate. Preference will be given to emerging artists who have some basketry weaving experience, have the physical ability to harvest and prepare roots, can walk necessary distances to harvesting spots and are committed to passing on the knowledge to future generations. The application deadline is April 1. 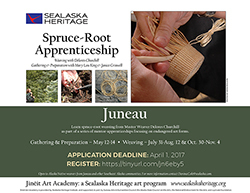 The spruce-root mentor-apprenticeship program is sponsored by Sealaska Heritage Institute and supported, in part, by the Juneau Arts & Humanities Council, the Alaska State Council on the Arts, the National Endowment for the Arts, and a private foundation. Delores Churchill is a Haida master weaver of baskets, hats, robes, and other regalia. Churchill learned these skills from her mother, Selina Peratrovich, a nationally recognized master weaver. Churchill is recognized as a leading artist and teacher of basketry and is a long-time instructor at the University of Alaska Southeast. She has work exhibited in museums throughout the United States, Germany and Canada, and has completed apprenticeships and training in Haida, Tsimshian, Tlingit, Aleut and Athabascan basketry as well as the study of Northwest Coast design and Chilkat weaving. Janice Criswell’s extended family is full of artists. Her maternal grandmother was a Kaigani Haida weaver. Her grandfather was a noted carver and metalsmith Her great-aunt, with whom she shares the Tlingit name S.x'awaan, was a weaver or the Kiks.ádi clan. Criswell is an accomplished weaver, a weaving instructor, and a visual artist who creates multimedia pieces. Criswell has taught basketry classes at the University of Alaska Southeast and worked at the Alaska State Museum with interns studying Native basketry and its conservation. Mary Lou King is a long-time advocate and supporter of NWC arts who has helped facilitate, organize and support several opportunities for education in spruce root-weaving over the years. She has gathered and prepared many roots. Sealaska Heritage Institute is a private nonprofit founded in 1980 to promote cultural diversity and cross-cultural understanding through public services and events. SHI also conducts social scientific and public policy research and advocacy that promotes Alaska Native arts, cultures, history and education statewide. The institute is governed by a Board of Trustees and guided by a Council of Traditional Scholars and a Native Artists Committee. Its mission is to perpetuate and enhance Tlingit, Haida, and Tsimshian cultures of Southeast Alaska.